Are you considering replacing your kitchen countertop but would like more information on kitchen countertops prices in Maryland, Northern Virginia, Baltimore, Alexandria or Washington DC? Our streamlined business model—we only sell and install countertops—means we get the best prices from the manufacturers, allowing us to pass our savings directly to you. Keep reading to learn more about how you can save on the cost of kitchen countertops. If you’d like to speak with a countertop expert, please call us at 410-712-0601 and we will happily answer your questions. 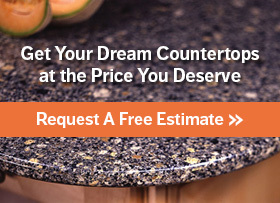 Or you can click here for a free kitchen countertop cost estimate. 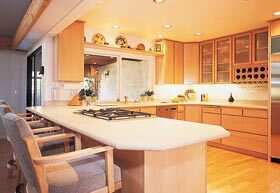 When replacing kitchen countertops there are two factors that contribute to your total cost—material and installation. You as the consumer have far more control over the material you select than the cost of installation, so this page will focus on material costs. Since materials are priced by square footage, the first thing to consider is the size and shape of your planned replacement counter. Once you know how much material you’ll need, start to explore different material options and compare them to your budget. Different materials can dramatically affect your kitchen countertops price. Typically, your most inexpensive option will be a laminate surface, which ranges from $5-$20 per square foot depending on the options and features you select. While this surface can be prone to scorching and scratches from sharp knives, it is also easily and inexpensively replaceable. Granite is usually one of the most expensive materials. Granite kitchen countertops cost between $30-$200 per square foot, again depending on selected options. However, this high price comes with benefits—granite counters can last a lifetime if properly maintained. Higher prices don’t always mean more durability though. Soapstone counters can cost as much as $200 per square foot, but can also crack, chip, or darken in color overtime. If you’re on a budget its important to draw a distinction between luxurious and functional materials. Consider what benefits you want from your countertop and how long you want it to last. Then begin to factor in the kitchen countertops prices to fit your budget. The best way to ensure that you’re getting the right counter for your budget is to ask the professionals at Express Countertops. We’ll be happy to provide you with a free in-home consultation so we can truly assess your kitchen, understand your needs, and make recommendations appropriate for your budget. Truthfully, there really is no “best” countertop. There’s only what works best for you and your situation. We’ll be sure to help you find exactly that. If you’d like to continue your research on your own, explore the kitchen counter options page. If you’re ready to transform your kitchen with a new countertop contact us today at 410-712-0601 or click here for a free kitchen countertop cost estimate. Express Countertops has been home of the “1 Week Installation Guarantee” since 2000. We know remodeling your kitchen puts a huge burden on you, so we’re in and out as fast as possible! How? Our business model is streamlined to only focus on the sale and installation of countertops. We are your countertop specialists.